Running your own business is a very time consuming, full on and often stressful process. It’s rare to find a moment when there is nothing to be done, there are no deadlines looming and no expectations to live up to. When a moment like this does arise we tend to react in one of two ways. For some, time off can be a source of anxiety – what if someone needs me? Everyone else is working, so shouldn’t I? What if my whole business crashes and burns in the next ten minutes? This is quite a common reaction and is hardly surprising as we live within a culture that romanticises the idea of being ‘busy’. We enjoy the idea of important meetings, briefcases, deadlines, climbing the corporate ladder, and juggling various aspects of our lives. On one hand we dread being stressed, while on the other we gauge our level of success by how stressed we feel. Equally, for others any time off is considered something to feel guilty over and so every moment of downtime is filled with various events – from sports activities to social engagements to spending time with friends and family to taking the kids on a day out. These events are lovely in moderation, but constantly are more exhausting than relaxing. So if you are someone who doesn’t enjoy taking time off because you end up feeling guilty then here are a few simple ideas that you can do in less than 20 minutes or simply at your desk! Running your own business means that you have a lot going on inside your head. So try setting aside 5 minutes every day to sit in silence and clear your mind. Don’t think about upcoming deadlines or that email you need to respond to – just let your mind wander. This is a really simple way to separate yourself from anything that is causing you stress and maybe give you a different perspective on things. Also concentrate on your breathing – take deep breaths and slowly exhale. This is a great way of relieving anxiety and stress from both your mind and body. This can easily be done at your desk when you have a spare few minutes. We live in an age when many of us can’t help but reach for our phone every 30 seconds. Unfortunately, too much screen time is terrible for your rest. In fact studies show that too much screen time can actually have damaging effects on your brain’s ability to exercise cognitive functions, make decisions, process emotions and control impulses. So turn off your screens and focus your eyes on something else. Take a look out the window or flick through a magazine for ten minutes. Just make sure you give your eyes a break. I don’t mean going for a 10km run necessarily (however if you’re into that then fair enough) but a 10 minute gentle walk will help you to feel more relaxed. The fresh air will instantly clear your head and if you take a pet, their joy of being let outside will definitely raise your spirits. Also something as simple as stretching – which you can do at your desk if you prefer – can loosen muscles and relieve body tension. One that you can do from your desk is roll your head from side to side or rotate your shoulders ten times clock-wise and anti-clockwise. This is particularly good if you spend a lot of time hunched over a laptop or tablet. When in doubt music is the answer. Put your favourite song on and empty your mind, maybe have a warming up of tea or even light a scented candle. Anything that makes you feel calmer and more relaxed. Laughter is a cure for many ills, including stress and exhaustion. A good hearty laugh can melt away stress instantly and it burns calories (bonus!). Instead of tuning out of work and tuning into Netflix why not find a new source of stimulation. Listen to a podcast? Visit a museum or gallery? Read a book? Work on a personal project? Or even cook a new meal? This is perfect for those workaholics and perfectionists out there as it not only gives you a break from your desk but also makes you feel productive. What do you do when you feel stressed? 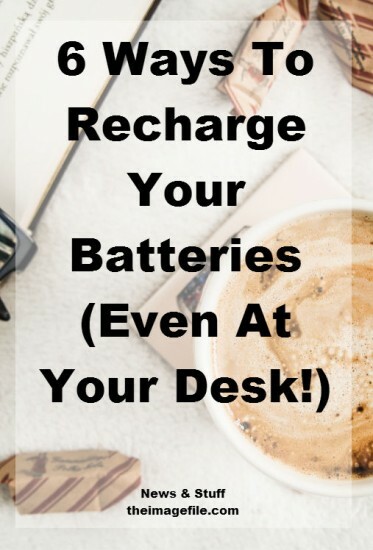 Is there something that helps you recharge your batteries?